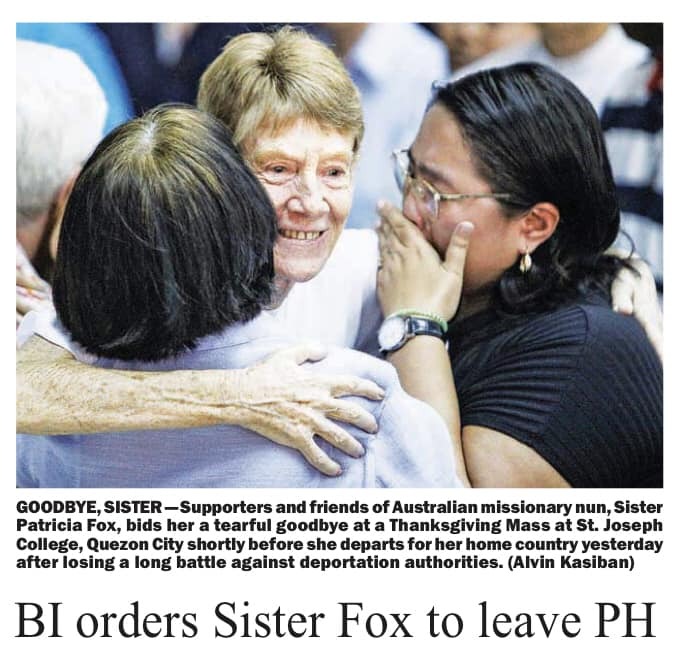 Sister Patricia Fox left the country for good after the long battle against her deportation order. Though many have cried a river on her leaving the Philippines after decades of charity services for Filipinos, the fact still remains that she broke the law on Bureau of Immigration Operations Order No. SBM 2015-025. The law states the limited rights of foreign tourists in regards to politics. They are prohibited to have engagement with any political activities regardless of the purpose, whether against or on the government side. A UP Professor, Francisco Pascual Tranquilino expressed his opinion through a Facebook post, starting his stance with “GOODBYE!” pertaining to Sister Patricia Fox. Even suggests blaming former President Aquino and De Lima for implementing the mandated law that made her kicked out of the country, falling flat on such fate. Tranquilino freely shared a bit of such law where Sections 1 and 2 are spoonfed for the readers. Section 2 stated deportation as a result of not adhering to the mandate. He even slams those people who kept riding on the issue putting the current administration on the bad light particularly Senator Kiko Pangilinan who has recently posted his grievances on the issue through Twitter. 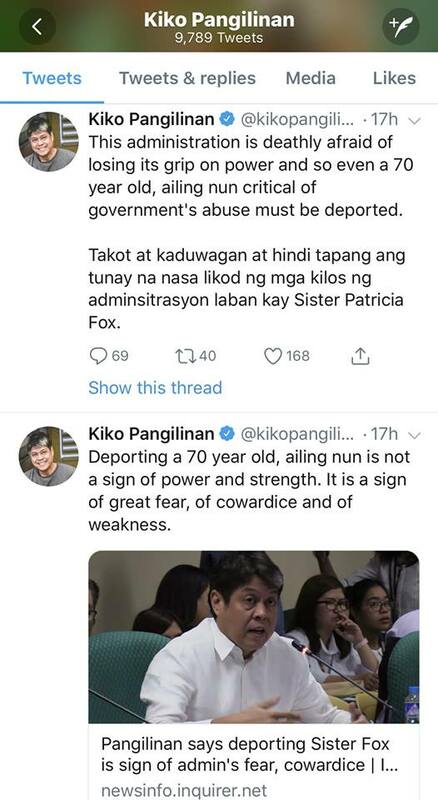 Pangilinan aired his sentiment on the deportation of the Australian nun where he described such act of the government as cowardice, great fear, inflicting strength to anyone braving to criticize the administration. He finds the deportation of the 70-year old ailing nun as a weakness from administration’s end as if pushing its critics off the cliffs. 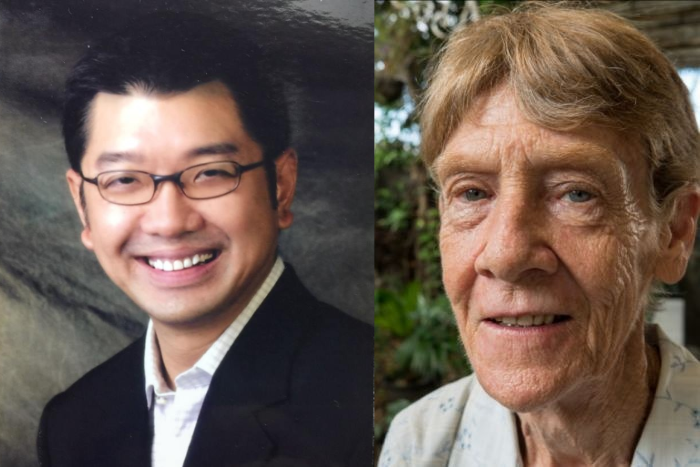 Tranquilino suggests Pangilinan do his research on how the government came up with its decision and the instances as to why such thing has to happen to Sister Patricia Fox, basically not adhering to the law intended for the foreign tourists. GOODBYE! Learn to follow the law wherever you are, being a nun who claims to be doing charity work in a foreign country does not exempt you. Section 1. Foreign tourists in the Philippine are enjoined to observe the limitation on the exercise of their political rights during their stay in the Philippines. 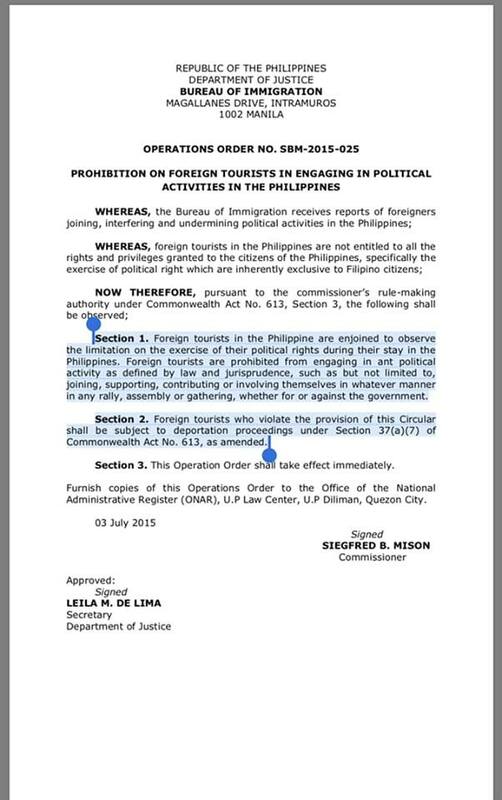 Foreign tourists are prohibited from engaging in any political activity as defined by law and jurisprudence, such as but not limited to, joining, supporting, contributing or involving themselves in whatever manner in any rally, assembly or gathering, whether for or against the government. Section 2. Foreign tourists who violate the provision of this Circular shall be subject to deportation proceedings under Section 37(a)(7) of Commonwealth Act No. 613, as amended. At para naman sa mga taong dakdak lang nang dakdak tulad ni Pangilinan, magbasa ka muna ng batas dahil ipinapatupad lamang ang batas na nilagdaan ng kaalyado mong si De Lima.